I have been working on my entry for the challenge at Studio L3, which is focused on Tim Holt's book A Compendium of Curiosities. This week we have turned to page 55 and the tinted vision fragments tutorial. 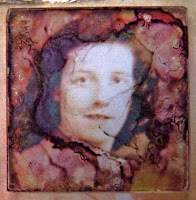 I only have 1 inch square memory glass I can use for this challenge and the photograph and materials I have used means I have gone with even more of a vintage look. The photograph is of my Mum when she was 16, (she is now 80), and it is one of my favourite pictures of her. As you can see I have used two tinted vision fragments on this. I started with a chipboard piece from my large box of shapes and covered it with DIs working through from mustard seed at the top, scattered straw, frayed burlap and vintage photo. The edges were done in walnut stain. Mum loves going to a little bingo session with some friends at her sheltered accommodation, so this stamp, by TH of course, seemed a good one to use. I have added some music paper, because she loves listening to her CDs and a very small photo of her with her brothers and sisters when she was probably about eight or nine. Down the left hand side I have put some TH tissue tape. I coloured a metal corner with alcohol inks and added that too. Now I look back at my piece I see I have missed off a small butterfly that I had cut out to stick on it, so that will go on later. She loves butterflies and that's one of the links to my blog title. I have decided to use this for a 12x12 scrapbook page and have already gathered the elements and papers for it so hopefully I can post it early next week, but it will be too late for the challenge so I must get this in as it is. I will let you know Linda when I have finished it completely so you can take a look. I have another post to come tomorrow morning as it's Ken's birthday and I have made him a fun card. Thankyou for stopping by to take a peek at my work. I hope you have some time planned for rest and recreation this weekend. Hi Brenda, this is so interesting and different, I just love looking at all the different sections of it. oh wow Brenda = this is fabulous . Forstly what a wonderful photo of your mum . I love the little tiles. This is an amazing piece of art, so many interesting aspect to it, I have been lost just looking at it for ages! Smashing project Brenda - I have those slide glass packs too, wish I'd bought the frames too now. Lovely fragment photo of your mom! Wonderful! How cool to use the fragments to just highlite parts of a full image. Turned out great. Brenda, this is stunning! That photo of your mom is amazing-- actually, both photos are great, and you've done such a lovely job with the Fragments. All the sweet little details that make this so personal make it all the more beautiful. I loved reading about your mom-- she sounds like a wonderful woman!